Too easy for C. Couldn't pass it up. A beautiful gravestone, but a chilling comment. Oh! Those dates hit me hard :( So sad! 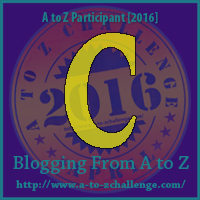 I am Parul from Happiness & Food and part of co-host Pam's Unconventional Alliance from the #AtoZChallenge. Stopping by to say hello. Good luck for the challenge. Thanks, Jo-Ann and Parul, for stopping by! Very nice. Thank you for sharing! I’m focusing on my music collection this month. And having fun. Hurray for that! Budded on earth to bloom in Heaven - a beautiful phrase.